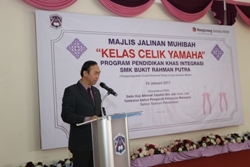 Sg Buloh, Selangor, 18th January 2017 –Hong Leong Yamaha Motor Sdn Bhd (“HLYM”)sponsored the Yamaha Literacy Classroom (“Kelas Celik Yamaha”) at SMK Bukit Rahman Putra under the school’s Special Education Integrated Program (SEIP). The launching ceremony was officiated by Dato’ Haji Ahmad Tajudin bin Jab, Deputy Director General of the Ministry of Malaysia who was accompanied by Tn Hj Mohd Salled bin Mohd Kassim, Director, Selangor Education Department.Also present at the event was the Managing Director of Hong Leong Yamaha Motor Sdn Bhd, Dato’ Jim Khor, teachers, and staff of HLYM. “The Ministry of Education always welcomes contribution and encourages goodwill from the private sector in enriching the community through education. We believe that a community that learns together bonds together. We applaud Hong Leong Yamaha Motor for their sponsorshiptowards providing and enhancingeducationalknowledge intheir effort to helping the community it serves,” said Dato’ Haji Ahmad Tajudin. Established since 2001, the SEIP has a total of 16 integrated classes accommodating 105 students and 19 teachers. These integrated programs providea conducive learning and teaching environment for both the students and teachers. 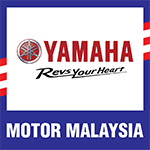 HLYM’s sponsorship was the latest collaboration between the company and SMK BRP after the Yamaha Safety Riding Science Campaign (YSRS) and Environmental Management System (EMS) activities. Through the SEIP sponsorship, HLYM has worked together with the school in the overall setup of the classroom which included complete sets of education tools and equipment and materials. Besides that, HLYM also shared their expertise andcollaborated with the school to developa series ofsystematic program. “We are proud to announce that the sponsorship of the Celik Yamaha Classroom is yet another fruitful collaboration with SMK Bukit Rahman Putra following our initial activities with the school.These activities are part of our commitment to contribute back to the community. We will continue to provide our support to the Ministry of Educationand nurture the good relationship between HLYM and SMK Bukit Rahman Putra through meaningful activities that enrich the community,” sharedDato Jim Khor. The Celik Yamaha Classroom is part of HLYM’s Corporate Social Responsibility (CSR) program which focuses on itscommitment to the community.